Why do we keep Livestock? John & Jean Critchlow. 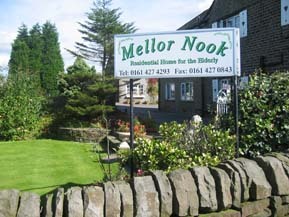 have been keeping livestock at Mellor for over 40 years so when in 1988 we opened "Mellor Nook Care Home for the Elderly" it was only natural that this would continue. With the main focus on care of the elderly it was less important for the livestock to be commercially viable. So this gave us the opportunity to look at less mainstream stock and farming methods and for several years we developed a flock of the traditional sheep to the area. 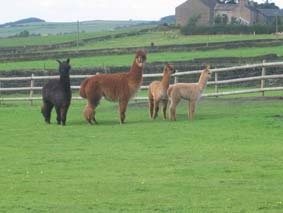 In 1999 we got our first Alpacas and form then on we we under the spell of these fantastic little animals. 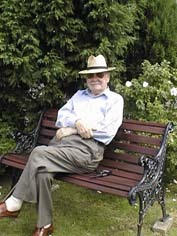 In 2001 my dad (John) died unexpectedly so I took over the responsibility of the livestock. 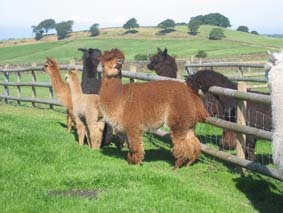 Following the "foot and mouth" crisis I decided just to concentrate on the Alpacas and as of 2005 our herd stands at 15. For anyone who wants to know what the attraction is with these little fury llamas the following information sums them up perfectly. 3000 years before the Iliad and the Odyssey were transcribed from myth to parchment, the Peruvian people were expanding a thriving economy built in part on the commercial value of their treasured alpacas. Through man's first known use of selective breeding, they were producing alpacas whose quality of fleece was far superior to even the best contemporary animals. 2000 years before King David united the tribes of Israel, members of pre-Incan nobility were draping themselves in multicoloured robes of gossamer sheen produced from alpaca fibre as they performed the mysterious rituals of their religion and culture. 1000 years before the Great Pyramid of Giza was completed, the ancient ancestors of the Inca were measuring their wealth by the numbers of alpacas they owned and were enjoying the finest garments woven from the fleece of their great alpaca herds. 500 years before Rome began to build its empire and the warring barbarian tribes were flooding into the territories of Modern Europe, the alpaca was firmly entrenched as a major cornerstone in the Incan empire which encompassed most of the western side of the South American continent. In the centuries that followed, a much more hardy and healthy alpaca developed in the stern and demanding lands above the clouds, where survival of the fittest was an absolute and constant reality. The curtain of history descended again on the alpaca and remained down until the mid 1800's, when Sir Titus Salt of London "discovered" the remarkable fibre of this musical camelid and began promoting its use in the finest textile mills and fashion houses of Europe. 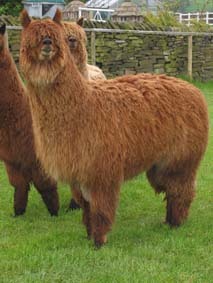 Even with this limited exposure to the outside world, the alpaca remained relatively unknown in the United States until 1983, when a small group of American importers began purchasing small numbers of these animals from select breeders in South America and bringing them to their farms as breeding stock. Today, over three million alpacas exist worldwide, with 98 percent still located in Peru, Bolivia, and Chile. The alpaca herd in the United States and Europe is estimated at 20,000 and is expected to increase gradually in the next two decades. As these amiable ambassadors of antiquity amble into their sixth millennium of partnership with their human owners, we wonder what new and exciting chapters will be written in their already amazing odyssey. The best-kept secret in animal husbandry is hidden no longer! Alpaca fibre will become even more prized as textile manufacturers, fashion designers, and the purchasing public become more enamoured with this remarkable fleece. An emphasis on selective breeding in the UK will produce a healthier alpaca with improved fibre and conformation. Meticulos genealogical records and tightly monitored registrations is maintained on all alpacas in order to insure progress and control of quality in these vital areas. White and near-white alpacas of high quality will continue to be in great demand due to their superior genetic structure and worldwide favour. Coloured alpacas will probably grow in popularity among British breeders due to their intrinsic beauty and the demand for non-dyed natural fabrics by health-conscious British consumers. But the most exciting milestone in the alpaca's future will be reached when "critical mass" is achieved. This fusion of fibre, fashion, and finance will usher in a new golden age for these enduring and endearing little creatures. When this happens, the great wheel of history will have completed one full turn, for the alpaca-so prized in his small and hidden world 5000 years ago, will again enjoy the featured spotlight on the much bigger stage of worldwide awareness, acceptance, and applause.